A light application for instant recording of events happening on the monitor and saving that to an AVI file at high quality. Nepflex Screen Recorder allows recording events happening on the monitor, including the mouse pointer and the visualization of the regular and right clicks of the mouse buttons. The program is good and simple. I contacted the authors to require a portable version and they created the linked portable package (not tested yet). I really like this app. refreshingly simple because most of the time you want to capture a screen-vid-cap you just want the very basics. True, other programs offer editing and annotation features but they rarely get utilised for everyday use. It's a pity it doesn't save any settings to an .ini file though. eg. Save location of vidcaps. Other than that, can't fault it. Short version: use Easy Screencast Recorder and dig into the Rylstim program below only if you have problems with it. This program addresses one of the two major problems in screen recording: creating simple video is too complex and the resulting files are often too big. At least with Rylstim, creating the file is very simple. Unfortunately - because there's no ability to edit the file or cut down on the screen size, even using a low framerate (8 per second) results in a roughly 10 meg file for a 3.2 minute video (screen resolution was 1440x900). That's admittedly better than many programs, but still not ideal. Super simple, with the exception of some understanding of which video codec to pick. This could make the program very useful for troubleshooting, software testing, or quick demonstrations. Not every recording program will let you pick the codec and framerate, so this was a real boost. The program highlights both left and right clicks, which is rare in freeware offerings I've tested. No screen sizing - At least on my setup it wanted the entire screen or nothing. Right or left click is just a red or a green circle - something more descriptive might be helpful (for example, other programs use a mouse icon with a picture of one button highlighted). I tested Softpedia's "portable" version 2.0 [linked below] on Win7x86). The settings it saves are few (codec, framerate, show right/left click, and path) so it might be acceptable to some. 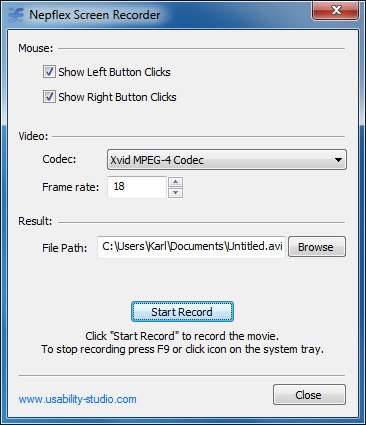 However, if you want to record a codec that has very broad support, XVid (aka h263), you have to install the included XVid codec each and every time. Just wondering if you ever tried the screen recorder function of FSCapture (not free, but it's worth the money) and what's your opinion about it. Currently it's my favorite tool of this kind. joby_toss wrote: Just wondering if you ever tried the screen recorder function of FSCapture (not free, but it's worth the money) and what's your opinion about it. Currently it's my favorite tool of this kind. My rationale has been that if I'm going to put down money, it's going to be for Camtasia, but I am a fan of FastStone's image viewer/editor. I might check that out. Thanks. I really wish I'd listened to Joby on this. The FSCapture screen capture tool and included editor program seem at first glance to be a little simplistic, but playing around with the program I found it had most of the same features of much more complex programs at a fraction of the price. I actually think I'd benefit more from a program that doesn't let you polish the video so much as I get too caught up in trying to make the video perfect. FSCapture simplifies the recording process. The only negative I can see so far is that it appears to only save (with sound) to WMV format. You could export to a high quality version and then re-compress to MP4 or similar, but I think that might leave some image artifacts. webfork wrote: ↑ You could export to a high quality version and then re-compress to MP4 or similar, but I think that might leave some image artifacts. 6. Use ffmpeg to mux the resulting streams to final: (> ffmpeg -i output.mp4 -i output.m4a -c copy final.mp4). It might look like a convoluted procedure but it's pretty straight forward, in fact (I could easily come up with some batch foo to automate the steps, but I never bothered). Even if I'm relying on defaults here, video and fluidity do nothing but get better after this; plus, size can see dramatic decreases. Best of all, no artifacts.